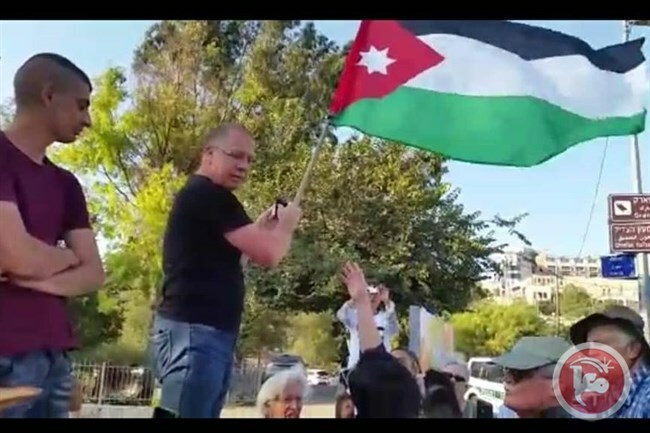 Israeli forces detained an international activist who raised the Jordanian flag in the Sheikh Jarrah neighborhood of occupied Jerusalem City in the central West Bank, on Friday. Eyewitnesses told Ma'an that Israeli forces suppressed a weekly march in Sheikh Jarrah neighborhood, during which they detained an international activist. Israeli forces confiscated ID cards of some protesters. Witnesses added that Israeli forces also pushed protesters who attempted to free the international activist during his detention. Protesters told Ma’an that Israeli forces continuously suppresses the weekly march in Sheikh Jarrah, confiscates Palestinian flags and ID cards of protesters and threatens them with detention. Residents of Sheikh Jarrah have been organizing a weekly march on Fridays for more than 10 years protesting Israeli settlement and seizure of lands and properties of the neighborhood. 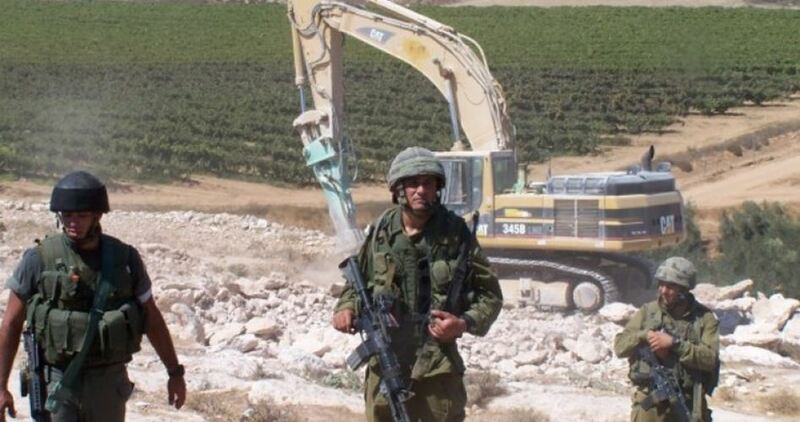 The Israeli occupation army on Tuesday afternoon bulldozed the main road leading to Nabi Samuil village, northwest of Jerusalem. According to local sources, an Israeli military force brought a bulldozer and embarked on destroying the road before dozens of local young men and citizens intervened and confronted them. For many years, the village of Nabi Samuil has been isolated by Israel’s separation wall and its residents cannot leave or enter it except through a military checkpoint. There are about 250 people living in the village, which lacks basic utilities and services and whose residents are banned from expanding their homes or building new ones. Israeli occupation forces (IOF) on Tuesday afternoon stormed Zububa town, west of Jenin, broke into a Palestinian house, and turned it into a military barracks. 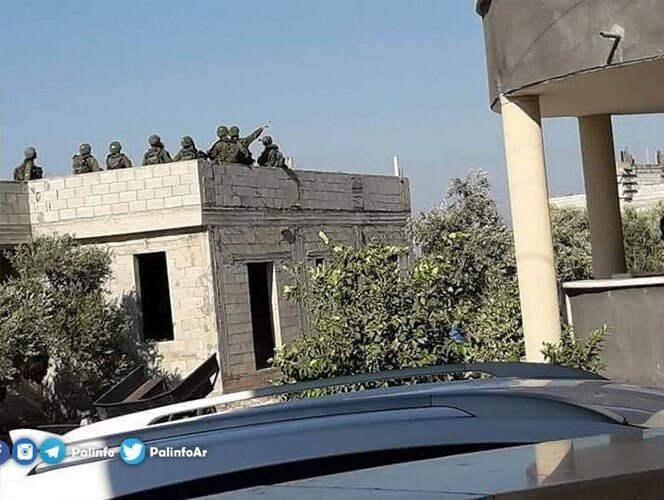 Local sources told the PIC reporter that the IOF soldiers locked the family up in one room, climbed the house's rooftop, and turned it into a lookout. The sources said that clashes erupted later in the area, which is close to Israel's Salem military camp, between the IOF and dozens of Palestinian youths. In another context, local sources reported that the IOF arrested a Palestinian youth while he was passing through Za'tara checkpoint, south of Nablus. They added that the IOF soldiers stopped the vehicle he was in, handcuffed him, and transferred him to an undeclared destination. Activists from the Popular Struggle Coordination Committee, on Monday, carried out an activity in which they handed out “warning” notices to the Israeli civil administration, regarding the consequences of participating in the demolition of Khan Al-Ahmar Bedouin village, which is considered a crime against humanity by international humanitarian law. Any soldier, officer or police officer; any employee or person of other standing in the Israeli military and/or Civil Administration; any person who partakes in the planning or execution of the destruction of Khan al Ahmar and the forced removal of its people, you are hereby forewarned. The demolition of the village of Khan al Ahmar and the forced removal of its inhabitants is in grave breach of International Humanitarian Law, to a degree amounting to war crimes and crimes against humanity, indictable in the International Criminal Court in The Hague (ICC) in accordance with the Rome Statute of the International Criminal Court. As a party to the Statute of the Court, the State of Palestine and its territory falls under the jurisdiction of the ICC, allowing it to preside over any felony that amounts to genocide, crimes against humanity, war crimes or the crime of aggression committed within its territory. After the activists put up the posters, a group of soldiers ran after and expelled the activists. Some of the activists managed to go onto a bus carrying Israeli soldiers, at the entrance, and handed them the warning posters, demanding them to stop serving the occupation army and refused to carry out acts inhumane and contradictory to international law. Head of the High Coordination Committee, Munther Amira, told the PNN that this event represents a clear message, in that the occupation army is implementing a war crime punishable by international law. “It is clear that Israel intends to carry out a new war crime to be added to its racist crimes since the establishment of the occupying state on the ruins and the plight of our Palestinian people and continues to commit more crimes,” Amira said, stressing the importance of striking the Israeli position even inside the occupation army. For his part, activist Mohammed Khatib said that the letter refers to official responsibility before international law, and is intended to leave an impact on the lives of the occupation soldiers and the crime they commit. Al-Khatib said that the Palestinian people will pursue the occupation soldiers and all those supporting the occupying state, in the international courts, since the implementation of the demolition means that they are complicit in the war crime that Israel intends to commit. Palestinian protesters and activists on Monday planted dozens of new trees in Khan al-Ahmar village, which is threatened with demolition. Member of the National Committee Against the Wall and Settlement Abdullah Abu Rahma said that this move came in response to Israel's demolition threats. An open sit-in has been held in Khan al-Ahmar, east of Occupied Jerusalem, for the 20th day in a row with the participation of senior Palestinian officials and foreign activists. Abu Rahma called for the largest popular participation in the sit-in, especially that the demolition is set to start on 1st October based on an Israeli court order. 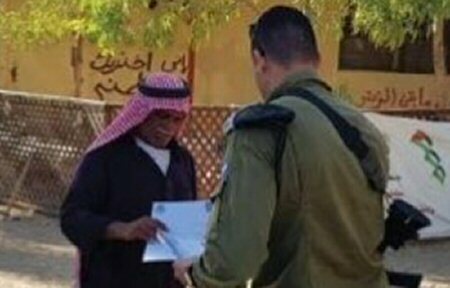 Israel's Supreme Court on 5th September rejected a petition filed by the residents of the Bedouin village against their displacement and ruled for demolishing the village. Israeli police on Sunday handed the families of Khan al-Ahmar notices giving them a one-week time limit to demolish their own houses. Approximately 200 Palestinians live in Khan al-Ahmar, 53% of whom are children, and 95% are refugees registered with UNRWA. The village has one school that is attended by 170 students from different areas. Israeli settlers on Sunday seized a Palestinian land in al-Khalil’s town of Tel Rumeida, in the southern occupied West Bank, and celebrated the Jewish Sukkot holiday. A PIC news reporter said dozens of extremist Israeli settlers showed up on a large Palestinian land tract and set up tents to mark Sukkot. The settlers performed dances and yelled racist anti-Arab slogans, before they closed off the main access road to the area and prevented the Palestinian locals from reaching their homes. Heavily-armed Israeli patrols broke into the area to provide a security shield for the settler gangs. 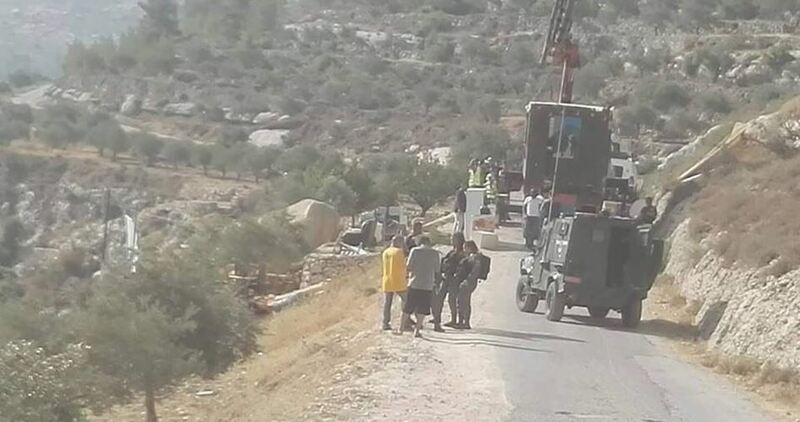 Israeli occupation forces (IOF) on Sunday confiscated a Palestinian mobile house and a vehicle in Masafer Yatta town, south of al-Khalil city. Local sources told Quds Press that the IOF took over a caravan owned by a Palestinian citizen in Masafer Yatta and confiscated its equipment. The same sources added that a vehicle owned by the Palestinian citizen Mohammed Okasha was seized in the same area. Israeli police, accompanied by a border guard force, on Sunday morning stormed the sit-in tent installed in Khan al-Ahmar village, east of Occupied Jerusalem. 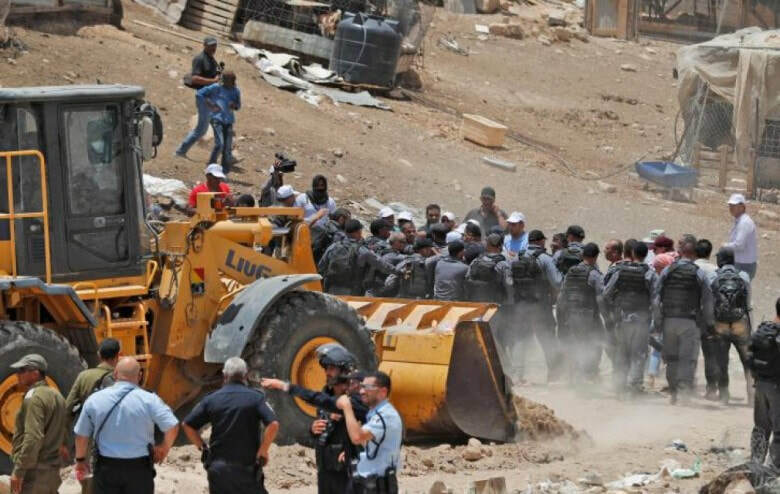 Media sources reported that about 20 police officers broke into the tent and handed Khan al-Ahmar families orders giving them a one-week time limit to demolish their own homes. Abdullah Abu Rahma, who leads Save Khan al-Ahmar campaign in press statements said that this attack was the second since the beginning of the day. Abu Rahma said that Khan al-Ahmar families fear that these stepped up attacks fall in line with Israel's preparations to demolish the village's houses and school, where the sit-in tent is installed. 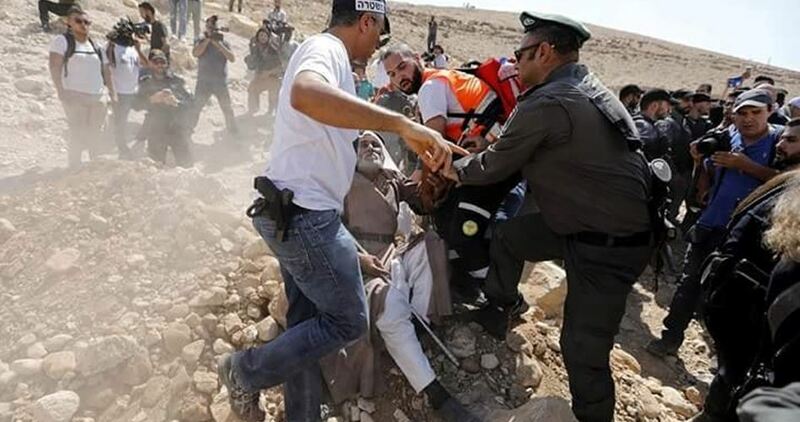 The Israeli occupation authority (IOA) has told Palestinians living in the Bedouin village of Khan al-Ahmar, east of Jerusalem, to demolish their homes within the next eight days and leave. The warning on Sunday comes just weeks after Israel's high court of justice rejected appeals against the intended demolition. "Pursuant to a supreme court ruling, residents of Khan al-Ahmar received a notice today requiring them to demolish all the structures on the site by October 1st, 2018,” the Israeli army’s civil administration said in a statement. "If you refuse, the authorities will enforce demolition orders as per a court decision and the law." Israel's intent to demolish the village, which is home to 180 people, and relocate its residents has drawn international condemnation. 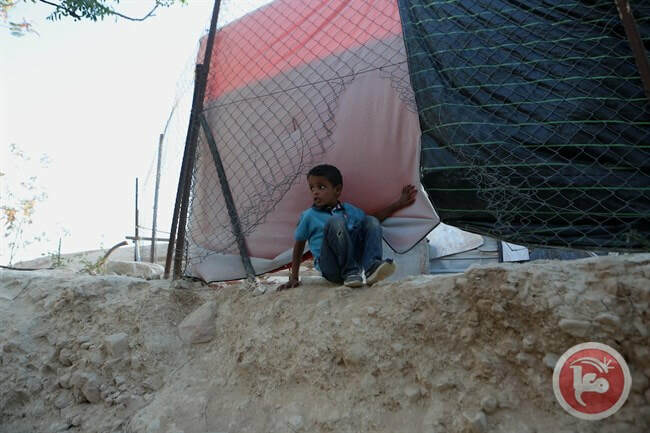 The Israeli occupation forces on Sunday ordered seven Palestinian households in Aqabat Jaber refugee camp, near the southern entrance to Jericho city, to leave their homes, pending their demolition in no more than three weeks. The Israeli forces gave seven Palestinian families a period of three weeks to leave their homes, paving the way for the demolition of the buildings. The targeted homes belong to Palestinian citizens Mousa Karshan,Ali Karshan, Mamdouh Karshan, Yousef Karshan, Met’eb Karshan, and Nayef Karshan. They cover areas ranging from 70 to 150 square meters. 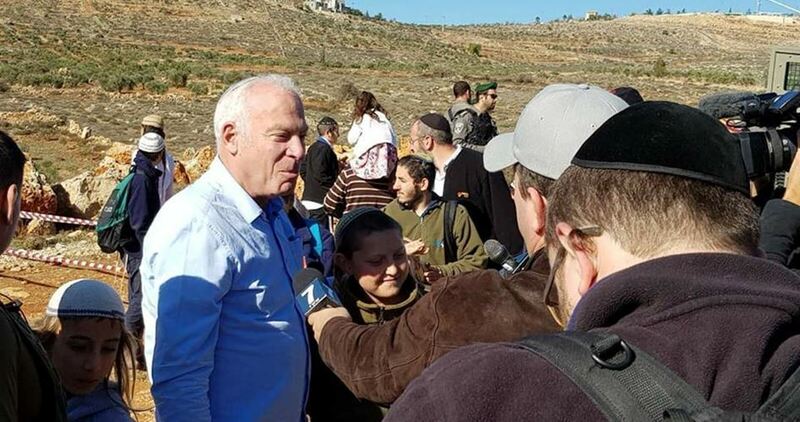 Governor of Jericho and the Jordan Valley Jehad Abu al-Asal said the measure makes part of Israeli intents to impose a new fait accompli across the occupied Palestinian territories and to forcibly deport the locals in favor of settlement projects, as has been the case with Khan al-Ahmar Bedouin village. 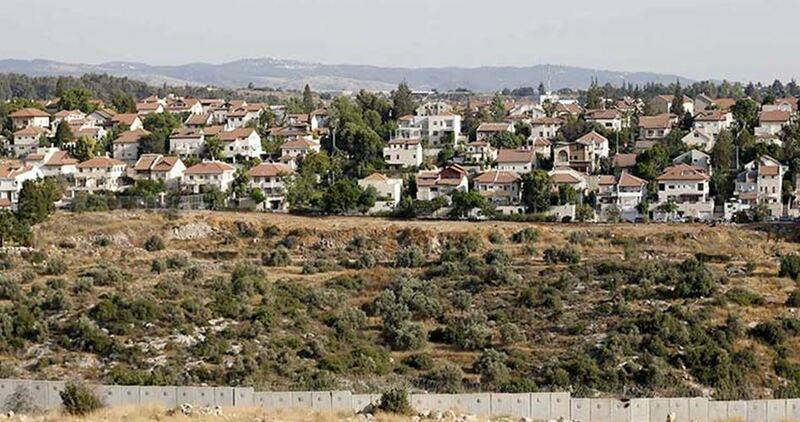 The governor called on the international community and human rights institutions to take urgent steps so as to pressurize the Israeli occupation to backtrack on its demolition orders and rein in its illegal settlement activity. Israel refuses to permit any Palestinian construction across territories it occupies as part of large-scale scheme of ethnic cleansing. 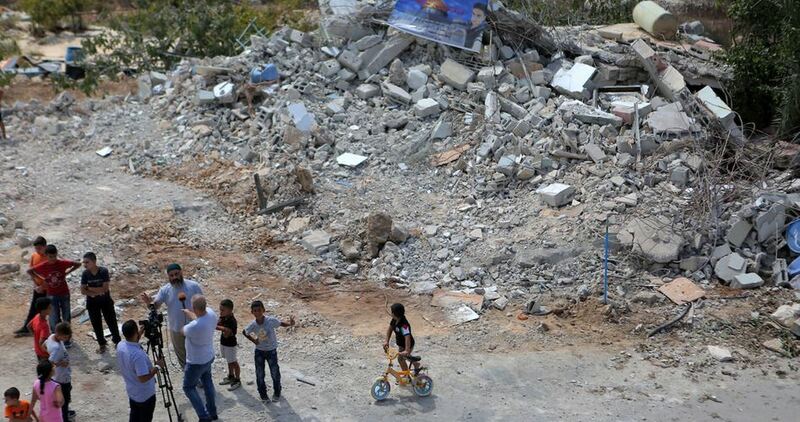 This has forced many Palestinians to embark on construction without permits so as to shelter their homeless families.